With its eye on millennials, Huawei focused on giving the Honor 8 a stylish design. It takes some design cues from Huawei’s P9, but wraps them in a more rounded, smoother chassis like the iPhone’s. The aluminum frame is sandwiched between edge-to-edge glass on the front and back, giving it both a shiny, polished look and a very slippery feel that makes it difficult to grasp or to set on seemingly flat tables without it sliding off. The Honor 8 seems to loathe gravitational potential energy, because it’s always trying to drop to the floor. The front and rear glass edges have a 2.5D radius that helps them blend into the chamfered edges on the aluminum frame. There’s still a small step as the materials do not flow together perfectly, but the edge breaks are enough to eliminate any sharpness along the sides while still providing some tactile feedback and additional grip when holding the phone. As phones continually get thinner, it becomes increasingly difficult to find space within the chassis for a camera’s sensor and lens array, leading to unsightly camera bulges on the backs of some phones. 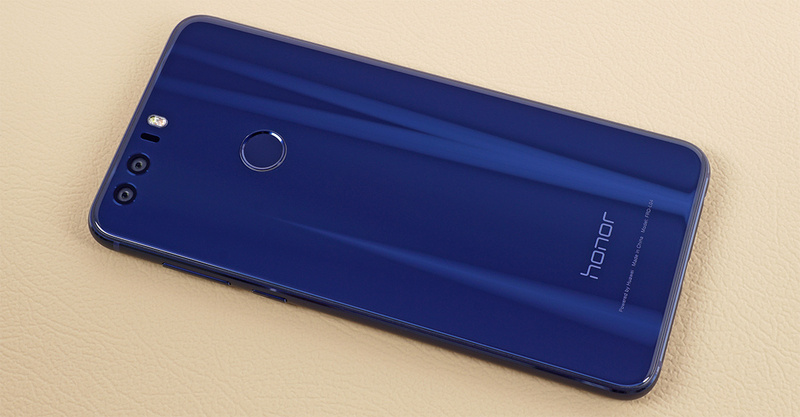 The Honor 8’s dual cameras, however, sit flush with the back and are covered by the rear glass. Huawei is pretty proud of this accomplishment, and it’s directly related to its dual-camera setup. By using both sensors together, the Honor 8’s cameras collect the same amount of light as a single, larger sensor. And because the smaller sensors require less z-height to fit an equivalent focal length lens, the overall thickness of the camera module is reduced. The two smaller sensors also fit into the space above the display where there’s extra room to work with. Placing the camera(s) in a more central position on the back means that some of the z-height inside the chassis is taken up by the display assembly, forcing the camera module to protrude from the back like on the Galaxy S7. Placing the rear cameras in the upper bezel means they need to be offset to one side in order to make room for the earpiece, front-facing camera, and sensors on the front. This results in some asymmetry, but I feel this is a fair compromise for a smooth back. Huawei did align the dual-color LED flash with the centered, circular fingerprint sensor on the back, which is a nice touch and keeps the elements on the back from looking too unbalanced. The capacitive fingerprint sensor is recessed slightly with a chamfered edge that makes it easy to locate. Underneath the Honor 8’s rear glass is 15 different layers, including filters, color-etched nano-film, and a milled 3D diffraction grating that diffuses light in interesting ways when moving the phone. The color also changes depending on the ambient light, and there’s a subtle swirled texture beneath the glass when looking closely. 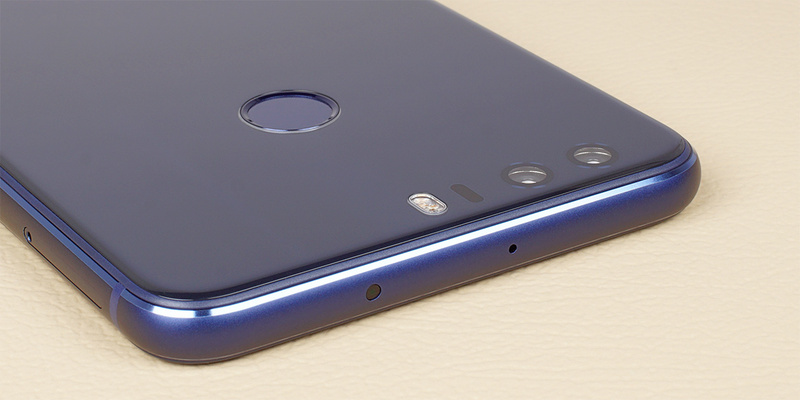 This attention to detail gives the Honor 8 a luxurious appearance; however, the glass back tends to attract fingerprints and is obviously less durable than metal or plastic. All of the buttons are located on the right edge, with a single-piece volume rocker positioned close to the top and just above the power button that has a very slight texture to it. The thumb on my larger-than-average hand falls right between the volume down button and the power button, making the controls easily accessible. People with smaller hands may have some difficulty reaching the volume buttons, though. 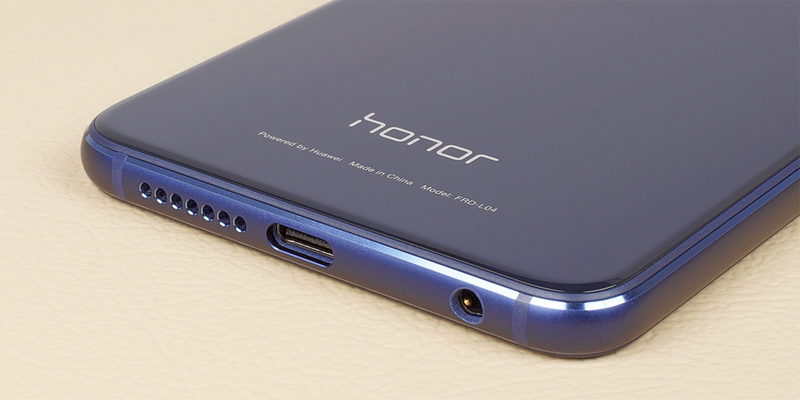 Biasing the buttons towards the top, like Huawei does with the Honor 8, makes it less likely to press the buttons accidentally when handling or picking up the phone. The SIM tray is located near the top of the left edge, and there’s a small, plastic antenna strip near the top of both edges. Because the pieces below the glass are made from plastic, there’s no need for the antenna strips to continue across the front and back. The USB Type-C port is centered on the bottom edge, with the single, downward-firing speaker to one side and the 3.5mm headphone jack on the other. The second, noise-canceling microphone is on the top edge along with the IR blaster. There are minimal bezels on the sides of the display, but the lower bezel is a bit larger than expected considering the fingerprint sensor is on the back and there’s no capacitive navigation buttons. While this places the top of the screen further out of reach, it does provide a place to hold the phone, especially in landscape, without accidentally tapping the screen. The upper bezel is the same size as the lower. The earpiece is of the smaller variety, making it difficult to hear sometimes if not perfectly aligned with the ear. 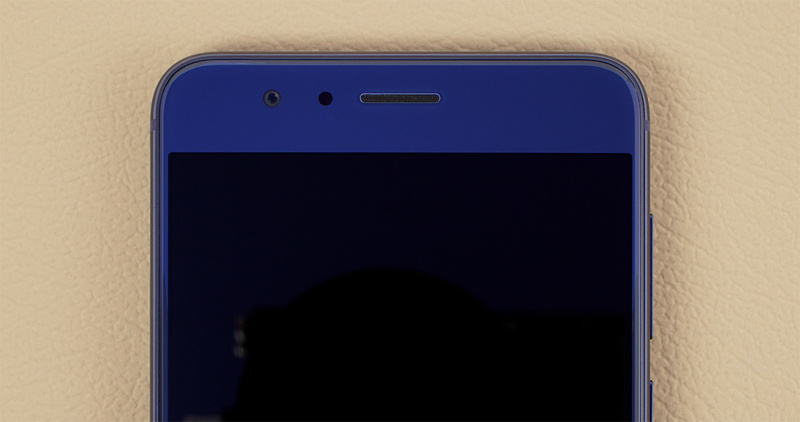 Like other Huawei phones, the Honor 8 hides a notification LED under the right side of the grille covering the earpiece. 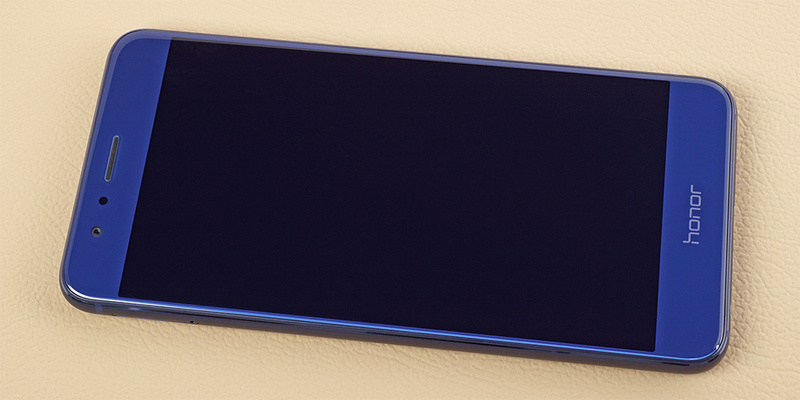 The front-facing camera and proximity/ambient light sensors sit to the left, an asymmetrical layout that makes room for the dual rear camera module on the other side. The Honor 8 is slippery but comfortable to hold. Its rounded corners do not dig into the palm, and the radiused glass and slightly curved sides of the aluminum frame eliminate sharp edges. Its smooth, glossy appearance trades durability for elegance and matches the Galaxy S7 in build quality. The Honor 8 currently comes in three different colors: Pearl White, Midnight Black, and Sapphire Blue like our review unit. The blue color is definitely my favorite, partially because it’s different from the usual silver and gold. Its shade changes from a deep blue to an electric blue depending on lighting conditions, making it nice to look at but difficult to photograph. Huawei is also adding a gold-colored version on October 20, 2016. These phones are usually sold to poorly educated people. And they are educated by the market that the more cpu core, the better phone. So people would usually prefer this SoC rather than Snapdragon 820, because Huawei has twice the CPU core number.